Of all the substances that one can study, imbibe, inhale or ingest, beer seems less likely to illuminate the inner workings of one’s mind than just about anything. But pursued as the object of study, beer forces us to confront the mysterious inner workings of our brain that in normal life remain hidden. As we struggle to train ourselves as tasters, to recognize and make sense of the many tastes and aromas of beer, we quickly find out that this is a very different kind of task. We are accustomed to learning that comes in through the front door of our conscious minds. We feed it ideas through language, appending them to our Model of Everything, altering our working model of the world. This is knowledge in the conventional sense. This supports the comforting notion that our conscious, cognitive brain is actually in charge of our mind. This is simply not the case. The brain is as layered as any onion. On the outside is our brilliant human brain we know so well, but just beneath those thick convolutions are other, very different systems that shape the way we feel, what we remember, how we act and who we are. They have been built up through countless ages of evolution, from the earliest chordates, forerunners of the vertebrates that we are. The chemical senses are unique in that they do not immediately go through the brain’s master traffic cop, the thalamus. Instead, they are wired to produce direct action, trigger emotions and modulate memories. Aromas have the ability to modify our heart rate and GSR (galvanic skin response, one of the things monitored in a polygraph exam) without the slightest conscious awareness of them. Like our other senses, taste and olfaction exist to help us find our way in the world, leading us toward beneficial nutrition and steering us clear of potential toxins. It’s life-and-death stuff, operating at the least-conscious levels of our brain. The signals from your tongue stop first at the brainstem, the primitive organ that controls heartbeat and respiration, among other things. And what does the brainstem do with that information? All by itself, way down in the deepest recesses of the unconscious, it decides whether we like this taste or not. Olfaction, too, connects to unconscious systems involved in memory and emotion, and these take their sweet time feeding information up to our thinking brains where language lives. One of the things all of us tasters struggle with is vocabulary. Putting the right word on an aroma is important as the final step in identifying specific aromas and crucial for communicating our findings to others. Like naming the colors of the rainbow, it ought to be as simple as child’s play, but this task turns out to be enormously frustrating. Science tells us that this is not poor memory or lack of diligence. The problems are far deeper. 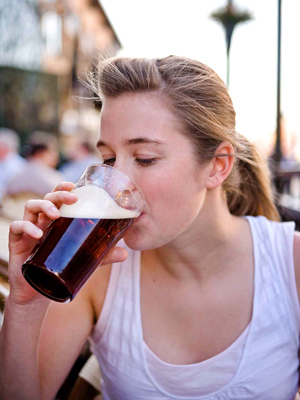 First, we don’t really have a great vocabulary for many of the smells we find in beer. We do pretty well with malt, as the chemistry of malt kilning is the ubiquitous Maillard reaction, source of most of the bready, caramel, toasted and roast flavors in many foods as well as beer. So, malt vocabulary is food vocabulary, and it fits pretty nicely. Hops are more challenging. With more that 200 identified aroma compounds, we are still stuck using nearly useless words like “spicy” (A code word meaning it smells like Czech Saaz hops) to try to describe them. Yes, some hops do smell a bit grassy, herbal, citrusy or a bit like berries, cat pee or tropical fruit, but only to a certain extent. We struggle to build a bridge from these vivid and distinct aromas to the confusing mix that is hop aroma. And that’s just the start of our woes. Our brains do not like to make words from aromas and do so only with difficulty. While it would be helpful now, it never supplied any evolutionary advantage, so the wiring did not develop in our brains. For perception to be translated into language, it has to be encoded semantically: organized into a logical framework, like the rainbow for colors as mentioned above. While we do group aromas into broad categories like floral, spicy and others, trying to organize them further is almost impossible for us. Where in the brain this coding is done is not totally clear, but evidence suggests that it may occur at a level far below our conscious awareness and importantly outside the semantic organizing networks our brains use for so many other things. And one more thing: The encoding we do use to tag various aromas likely includes a strong emotional component. Try organizing that. What’s more, it appears that language may actually interfere with the encoding process relative to aromas. While it is important to become familiar with the vocabulary words, there is evidence to suggest that these verbal constructs may overly dominate the way we perceive the actual aromas, especially when we are new to the game. We rely on the meaning of the words, forcing us to try to find those concepts among the richer sensations produced by any aroma. As we learn aromas and understand their context and the ways they present themselves to our brains, we swap out the training-wheels vocabulary words for more sophisticated and richer internal tagging. This means no amount of rote learning of words and the chemistry behind them can turn one into an experienced taster. It takes a lot of time and effort, smell-by-smell, to really build an internal map of the aromatic wonderland that is beer. If that weren’t trouble enough, other senses interfere as well. Because the real world is complex and floods in through various stimuli, out brains have no need to keep things in separate silos. This paints a richer portrait for us in the natural world—the sound, the sight, the smell of that tiger leaping at us, for example. Naturally, this can cause problems in something as far from the jungle as beer tasting. We are primarily visual creatures, and our other senses try to find what our eyes hint at, often leading us down a wildly wrong path. It is well-known that when wine experts are presented with white wine dyed red, they find all manner of red fruits like cherries, bramble, blackberries, and more. While you’re laughing at the silly wine people, consider this: We’re just the same. A slight variation in beer color creates irresistible expectations of flavors to match. It was a common trick in the old days to add caramel color to a pale lager to make a dark lager or bock, and most people never noticed the beer didn’t actually taste dark. This trick is used in reverse with black IPAs, which have plenty of color, but if done right, very little roasty flavor. Our brains manufacture it for us, anyway. Try one blind sometime and see for yourself. Aroma and the tastes we detect on the tongue are very closely coupled. In fact, this coupling creates a sixth “phantom” sense called flavor. These are sensations from the mouth—especially when swallowing—that we know have a strong aromatic component, but are perceived not as aroma but as flavor. Like aroma and taste, flavor has a strong emotional aspect that usually manifests as familiarity, preference or their opposites. As you develop into a taster, you will become aware of your sensitivities to various chemicals. All of us differ, compound by compound. Large breweries calibrate their taste panels and develop profiles for every taster. Most of us have to do it by experience, especially while sitting around the judging table. If you are consistently the only person on the panel not picking up on a particular smell, you can conclude that you may be less sensitive to it. Most of us are supertasters on something or other, so watch for that as well. It’s not hopeless. Practice does improve our skills. Eventually we come to terms with beer vocabulary and build an internal model of beer’s qualities. And there are tricks. A technique that helps identify aromas is to use those little memory flashes triggered by aroma, lingering in the candy store, or grandma’s house, or wherever you find yourself just long enough to recall what might be triggering that feeling. You also learn not to censor yourself and just blurt out whatever idiotic word pops into your head as you take a whiff. Upon examination, it’s usually correct. Also, while our chemical senses do decline with age, one can more than make up for it with practice and effort. Of course, beer doesn’t hold the answers to all of life’s mysteries, but it does shine a fascinating light on our oft-hidden inner life. The next time you climb that mountain to see your guru, pop the cap and ask him if he wants to taste a beer. It’ll really blow his mind. This column appears in the May issue of All About Beer Magazine. Click here for a free trial of our next issue. Randy Mosher is author of Tasting Beer and two other books, with two more to be published in 2014. He is a senior instructor at the Siebel Institute, a full-service creative consultant to the craft brewing world and a partner in 5 Rabbit Cervecería, a Latin-infused brewery in the Chicago area.